The number of people who have been displaced by the severe drought ravaging several parts of Somalia has risen to 766,467 since November 2016, the UN said on Tuesday. The UN Office for Coordination of Humanitarian Affairs (OCHA) said in its latest report that most of the displaced people are hosted in settlements in Baidoa (177,000 people) and Mogadishu (161,000 people) districts. "The displaced families are in need of shelter and other non-food items. The continuous arrival of newly displaced population has contributed to the worsening of food security and nutrition in IDP settlements in areas such as Baidoa and Mogadishu, OCHA said in its latest humanitarian report released on Monday night. 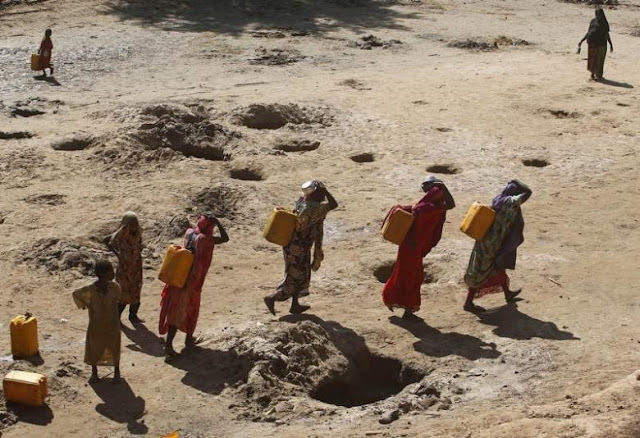 The majority of the displaced originate from Bay (197,000 people), Lower Shabelle (138,000 people), Mudug (100,000 people) and Sool (60,000 people) regions, that are worst affected by the drought. "Additionally, nearly 1.1 million people remain in protracted displacement countrywide. Inter-communal tensions in Xeraale, Abudwaq district, Galgaduud region resulted in the displacement of some 13,800 people between July 1-18," said the UN. The report says more people are likely to flee as the tensions continue, adding that conflict in Gedo, Lower and Middle Shabelle continued to displace people in July. According to the UN, the arrivals are putting pressure on existing facilities such as water points in IDP settlements. "There is need for additional latrines, sustained provision of safe water, and hygiene kits. Lack of waste disposal areas in most IDP settlements and poor hygiene practices increase the risk of diseases," said the UN. Humanitarian partners estimated that at least 100 million U.S. dollars is required per month to sustain current levels of response, with a reach of more than 3 million people receiving life-saving assistance and livelihood support. As of July 28, 897 million dollars had been received or pledged for response in Somalia in 2017, said the UN. This includes 611 million dollars towards the revised 1.5 billion dollars 2017 Somalia Humanitarian Response Plan (HRP) and 286 million dollars for activities outside the HRP.